WOW! The 50th year reunion is over and was a wonderful event. Congratulations and my (Bart Rosenberg) heartfelt thanks to the committee that worked selflessly and tirelessly to create a divine weekend. Perfect! Our 60th year reunion will be Father's Day weekend, June 19, 20 and 21, 2026. Plan now! There may be interim events - how about a 70th birthday party for us all in 2018? Watch this space or the Facebook page. Thanks to everyone who made the effort to attend, some travelling great distances to show their love for our class and classmate friends. We're excited to announce our 50th year reunion June 17, 18 and 19, 2016 at Maketewah Country Club, Reading Road just south of Woodward and at a beautiful park in Blue Ash. Show off your grand kids at the Blue Ash picnic! Book your travel and lodging soon for maximum flexibility. FRIDAY, JUNE 17, 2016 7PM - 9PM Meet and greet at Maketewah Country Club. 5401 Reading Rd. Cash bar, bowling, and light hors d' hoerves. SUNDAY, JUNE 19, 2016 - 11AM - 2PM Farewell at the Blue Ash Recreation Center (shelter #3} for a picnic in the park. Snacks and drinks provided. Families, children, grandchildren are invited. Cost - $75 per person for the weekend. Contact Us with your name, address, email and other pertinent information any time you want to. Your classmates are looking forward to seeing you! 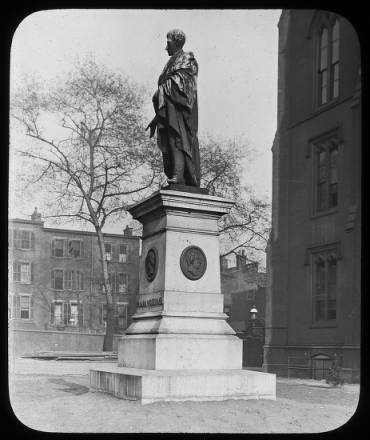 Statue of William Woodward in front of the second Woodward High School, 1855-1907.